While Loretta was working on a picture called The Perfect Marriage, Dore Schary visited her on the set. Schary, a former writer and producer at Metro-Goldwyn-Mayer, was now the production chief of Vanguard Pictures, run by David Selznick, Myron's brother. Selznick wished to do The Farmer's Daughter as his next project, a movie about a Swedish-born girl who works as a maid for a United States congressman, and eventually becomes a congresswoman herself. The starring role had been offered to Ingrid Bergman, a genuine Swede, but she had turned it down. Several other starlets had been considered as well, including the skater Sonia Henie, also from Sweden. But Dore Schary had been certain that Loretta was right for the role. As they spoke on the set, Loretta expressed doubts about her ability to master a Swedish accent. Schary had a solution; hire Ruth Roberts as a voice coach. Ruth was Swedish, and had helped Ingrid Bergman lose her Swedish accent. "We always said Ruth took away Ingrid's accent, and gave it to me," Loretta used to quip. Loretta agreed to do Farmer's Daughter. The role of "Katie" was such a departure from the glamorous women she usually portrayed, it would be a great challenge. I'd ask for another take, follow her directions on these small touches, and we were all surprised at how well they worked. If Ruth had been a man in this era, she could have been a director, and a superb one, at that." 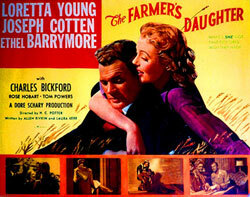 The Farmer's Daughter was released in spring, 1947, to wide acclaim. Moviegoers loved it and so did the critics. Delighted, Loretta soon started work on The Bishop's Wife, another immensely charming movie featuring Cary Grant - and her old pal David Niven. Both men were fun to have around. When he had first come to America from England, David Niven lived the the Young family's guest house on Sunset Boulevard, and "Cary is probably the only leading man I didn't fall in love with," Loretta recalled. "But we were good friends. He was always searching for answers about faith and religion." The Bishop's Wife was released to strong box office receipts in December of 1947. Two winners in a row! How could Loretta have doubted God's hand in her career? But nothing could have prepared her for the next step. One morning the phone rang. It was Dore Schary. "Do you remember me telling you that you could win the Academy Award for Katie?" he asked Loretta. "How could I forget?" she laughed. "Well, you're one step closer. You've been nominated for best actress." Schary then read her the list of the other nominees; Joan Crawford for Possessed, Susan Hayward for SmashUp, Dorothy McGuire for Gentlemen's Agreement, and one of her best friends, Rosalind Russell, was nominated for her performance in Mourning Becomes Electra. Loretta was thunderstruck. In those years, the Daily Variety trade paper held a straw poll to see who might win the Oscar. Rosalind Russell was favored by a wide margin. Loretta finished fifth, out of five. But Roz was not convinced she was a shoo-in. On the morning of the awards, she phoned Loretta. "Nervous?" she asked. "Not really. I'm just happy to be one of the five, and wear this beautiful Adrian dress." The awards were given at the huge Shrine Auditorium, with a stage that seemed to go on forever. It was darkened except for lights on the tiered shelves holding the statues of Oscar. "We had sat through the whole event, and amazingly, every Daily Variety poll winner had also won the actual award," Loretta remembered. "There was no suspense remaining for the final two Oscars." As predicted, Ronald Coleman won the Best Actor award. Then it was the women's turn. People began gathering their coats to leave. Frederic March stepped to the microphone and announced the final award. "And the winner is . 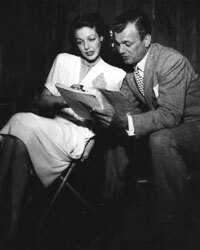 . ." he opened the envelope, "Loretta Young for The Farmer's Daughter!" The entire audience gasped, then erupted in astonished applause. Tom pushed Loretta out of her chair. "Go get it! Go get it!" He laughed. She flew up the stage stairs in absolute shock. Her mind was a blank. "Holy Spirit, help me!" she prayed. And suddenly, the words were there. "The Academy Awards has always been a spectator sport for me," she began as the clapping died away. "But tonight I dressed for the stage, just in case!" Everyone laughed. 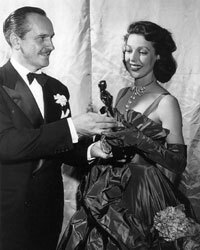 "And as for you," Loretta held up Oscar, "at long last!" She kissed it, said "good night, and God bless you," and walked in a daze off the stage. Loretta bolted to the phone backstage, and immediately dialed her mother's number. Gladys had not attended the ceremonies because she was sick with the flu. "Mama!" she cried, "It's Gretch! I won!" "That's nice, dear," a sleepy Gladys answered. "What did you win?" It would be years before her mother recognized the significance of her daughter's achievement. Excerpts © copyright 2000 Joan Wester Anderson. All rights reserved.